My enthusiastic 10 year old neighbour and I recently made some more crystal slides. Easiest and perhaps most interesting was stearic acid. Stearic acid is a saturated fatty acid with an 18-carbon chain and has the IUPAC name octadecanoic acid. It is a waxy solid and its chemical formula is C17H35CO2H. Its name comes from the Greek word which means tallow. 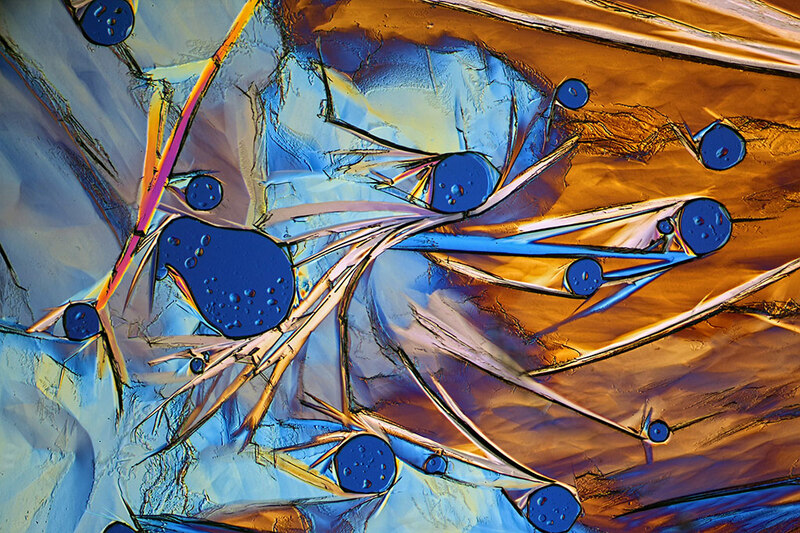 Stearic acid melts readily at low temperature (69 degrees C) and produces interesting and unusual waxy crystals when it cools. It's readily available on eBay, as its used in home made candles, soap and cosmetics and is very non toxic. The crystals produced work well with ordinary pol +/- a retarder as well as DIC +/- a retarder. 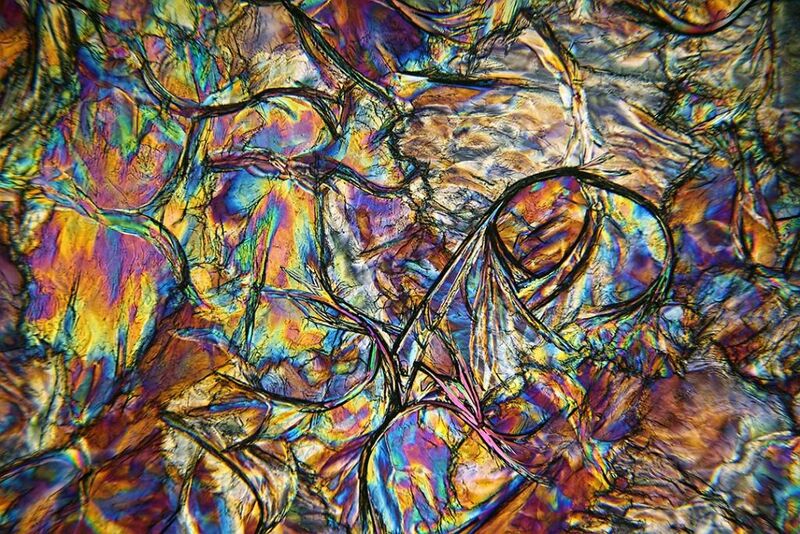 Attractive pastel colours and unusual shapes are produced, which make a nice change from the more garish colours produced by many crystals with polarised light. 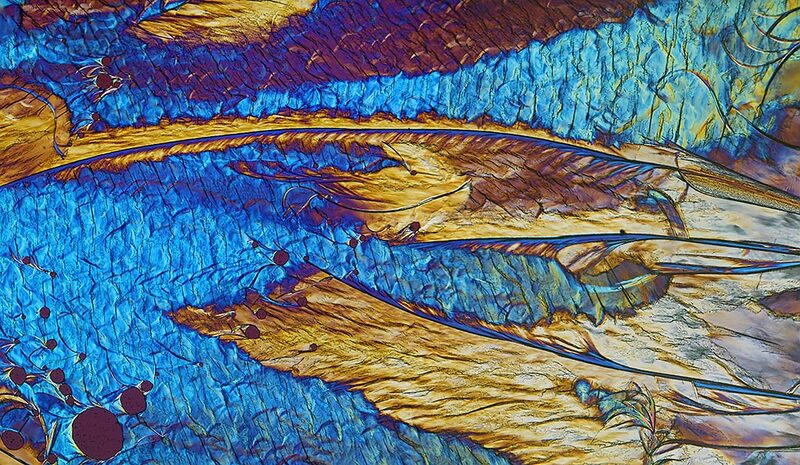 To produce crystals we simply placed a few milligrams of solid stearic acid on a clean slide, melted the solid on a warm heating ring, and immediately placed a coverslip on top. Crystallisation occurred immediately on removing from the heat. Different areas on the slide produced a range of interesting shapes and use of different retarders in conjunction with polarised light and DIC (one of my favourite retarders is two layers of ordinary Sellotape on a clean slide) gave a range of more subtle colours. Leitz X4 plan fluorite objective, polarised light with retarders. Leitz X4 plan fluorite objective, polarised light with retarder, stitch of 11 images. Nikon X10 Plan DIC objective, 'standard' DIC without retarders or variable compensation. Nikon X10 Plan DIC objective, 'colour DIC' with variable compensation. 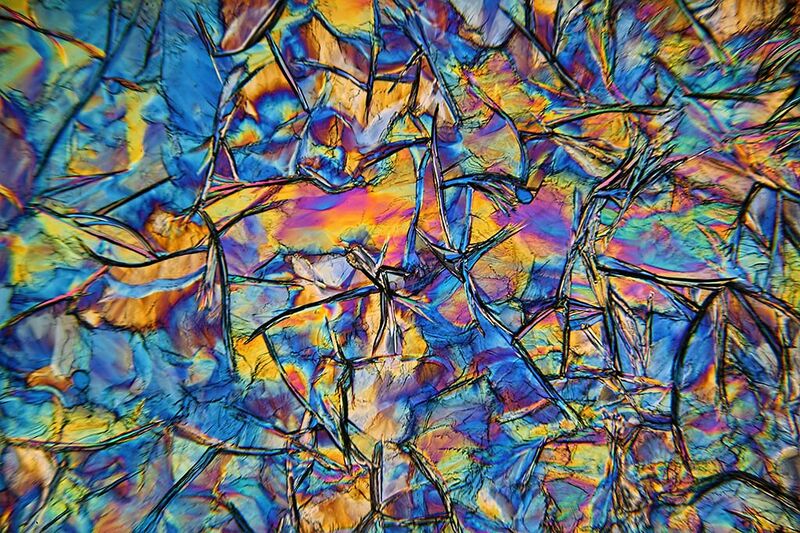 Great crystals, and stearic acid sounds like a wonderful chemical for work with kids. Not only is it "non-toxic", but it's actually digestible and arguably a pretty healthy fat! Stearic acid is a saturated fatty acid that, in contrast to other long-chain saturated fatty acids, does not raise plasma LDL cholesterol. We recently demonstrated in a controlled feeding study designed to evaluate the effects of individual fatty acids, that compared with a carbohydrate-control diet, a diet containing 8% of energy (en%) of saturated fatty acids (lauric + myristic + palmitic) increased LDL cholesterol 5%, whereas an equivalent amount of stearic acid in the diet did not alter plasma LDL cholesterol (1). Very nice and interesting shots! Being a fan of pol crystal shots, just ordered some from eBay. Makes one want to give this a try whenever some spare time shows up!! Very nice colorful shots. I was also thinking to order some. I agree, sometimes with crystal slides, a larger stitch gives a better overall impression of the crystal 'landscape'. 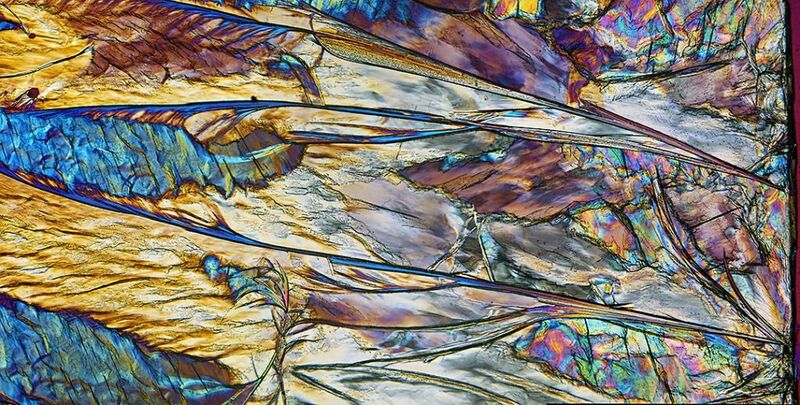 When we took the first set of images of these stearic acid slides, I wanted to give my young friend as much involvement as possible. She was able to make slides, and once I had set the microscope up for polarised light or DIC, to select areas to photograph, check the focus using 2X zoom on the monitor, and operate the shutter release. I thought collecting multiple images for stitching was over complicating things a bit. I'm sure we'll get round to it. I subsequently returned to the slides myself and collected images for a couple of stitches for completeness. 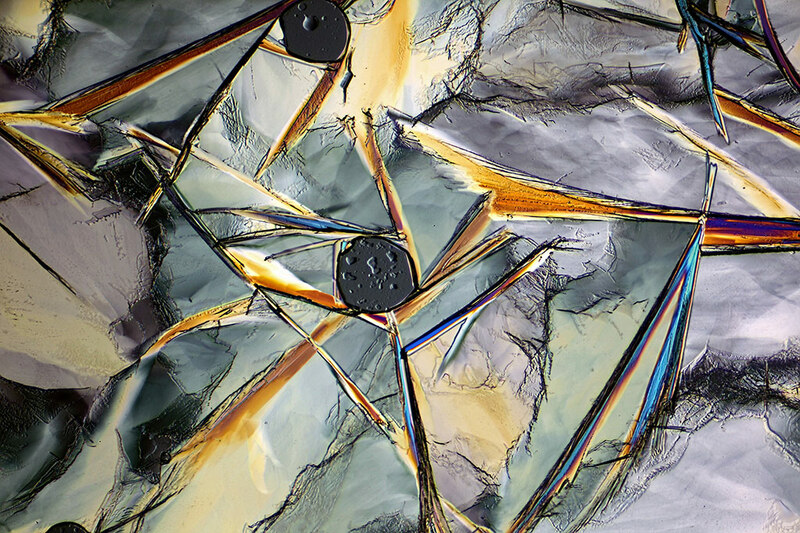 Returning to crystal slides is always worthwhile as things can change with time in an interesting way, especially where crystals are exposed directly to the atmosphere without a coverslip. Since you liked it here's another stitch from the same area on the slide. Leitz X4 plan fluorite objective, polarised light with retarder. Stitch of 9 images. A couple more images of Stearic acid, and then I want to move on to the other easy safe chemical we tried successfully, citric acid. Leitz X4 plan fluorite objective polarised light with retarders. Nikon X10 Plan DIC objective, 'standard DIC', no compensator or retarder. 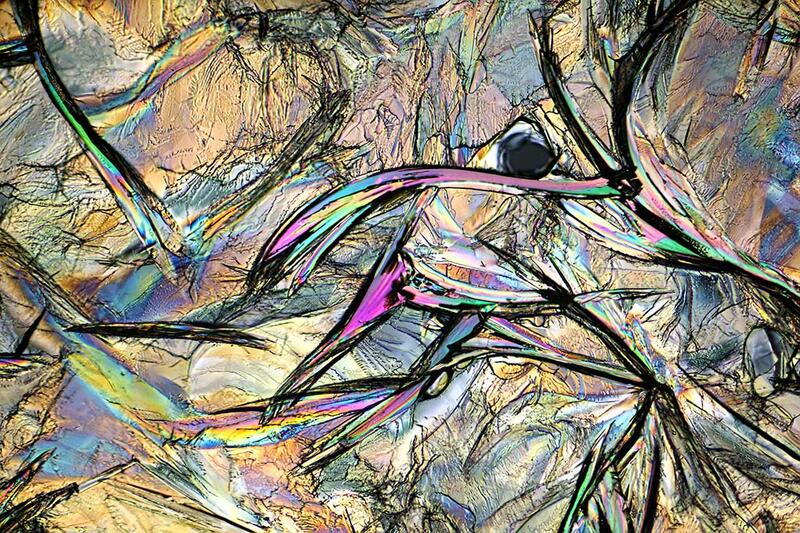 I think stearic acid is a good choice for anyone wanting to experiment with crystals under the microscope in a safe and simple way.